The California Grapevine Registration & Certification Program is administered by the California State Department of Food and Agriculture (CDFA). It targets the elimination of specific grapevine diseases such as leafroll, fanleaf, corkybark, stempitting and fleck that are spread from vine to vine by grafting and/or vegetative propagation. Some of the targeted diseases are also spread by soil nematodes (fanleaf) and mealy bugs a leafroll vector. Under the auspices of the CDFA Program, correctly named grape materials that pass specific disease tests are identified and/or created. Once identified, Foundation materials are maintained by FPS and then multiplied by participating nurseries into commercial quantities according to procedures prescribed by the Program. The adverse effects of the virus diseases targeted by this program range from delayed ripening, reduced sugar, color and yield (as with leafroll) to leaf malformations, shot berry fruit, and yields that may drop to zero (as in the case with fanleaf). There is no way to remove these diseases, if present in a vineyard, short of replacing the vines. If dagger nematodes (Xiphinema index) are present in the soil, fanleaf-infected vines can also serve as a source of infection and transmit the disease to healthy vines. These nematodes can survive in the soil up to 10 years on roots left behind after a vineyard is removed and will infect healthy vines that are planted later in the same site. For these reasons, CDFA Regulations include the requirement that grapes not have been planted on or within 100 feet of a potential vineyard site in the last 10 years. The Foundation source vines for the California Grapevine Registration and Certification Program are maintained by FPS in its Foundation vineyard blocks at UC Davis. These blocks contain vines that have been tested, or were propagated from sources that have been tested, using all the methods prescribed in CDFA Regulations for Foundation stock. During the first two years after a qualified vine is planted in the Foundation block at FPS, the vines are tested annually for leafroll-associated and nematode-transmitted viruses using ELISA tests. 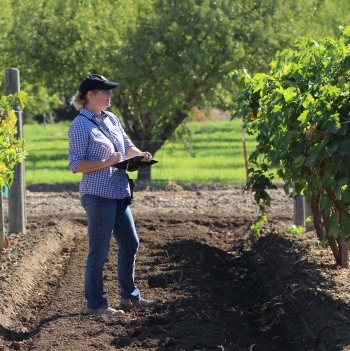 In addition, as soon as the vines are large enough to produce fruit, they are visually inspected by a professional grape variety expert who checks the accuracy of the variety identification. As soon as disease negative vines are verified true to variety, they can be registered in the CDFA Program and sold as Foundation stock. All vines in the Foundation block are visually inspected twice per year for disease symptoms. Each year one third of all the vines in the Foundation vineyard are retested by ELISA for leafroll- associated viruses so that each vine is tested every three years. In addition, one- half of the vines in the Foundation block are checked each year for nematode- transmitted viruses so that each vine is tested every two years. Any vines with suspicious symptoms are placed on "hold" and are either retested or held for further observation. Most "holds" are the result of questionable results from laboratory or field virus disease tests and/or observations about the general health, genetic characteristics or varietal identity of a vine or selection in the foundation vineyard. Vines showing general health problems or symptoms of diseases such as measles or eutypa are put on hold, as are vines suspected of being incorrectly named. Circumstances that trigger a "hold" designation are not certain or serious enough to cause a vine to be removed from the California Grapevine Registration and Certification Program. However, materials are not distributed from vines on "hold" unless customers are informed about the concerns that generated the "hold" and are willing to accept all risks associated with the condition. Vines placed on "hold" are reviewed periodically by Dr. Maher Al Rwahnih, other plant pathologists, and grape variety experts. If further testing or observations clear the vine from suspicion of disease, genetic or naming problems, the "hold" is removed. If questions persist, the "hold" remains and, if they are unquestionably linked to a problem that will adversely affect propagation materials, the vine is removed from the foundation block. All grape materials distributed by FPS are identified as to their single vine sources. Special training and pruning methods are used in the Foundation block to minimize the risk of canes from one vine growing into another. This helps to make single vine source identification more accurate. The CDFA Grape Registration & Certification Program includes provisions for three levels of "certified" stock. Propagation materials derived from Foundation mother vines in the FPS Foundation block are called California Foundation stock. Formal participants in the CDFA Program purchase Foundation stock from FPS and plant it to create vineyards called California registered increase blocks. These blocks are inspected annually and tested as needed by inspectors from CDFA. Cuttings taken from registered increase blocks are called California Registered stock. Grapevines made by rooting Registered cuttings or grafting Registered scion (fruiting) cuttings to Registered rootstock cuttings are called California Certified grapevines. CDFA regulations govern all Grapevine Registration & Certification Program responsibilities, eligibility requirements, planting and maintenance requirements, inspection and testing procedures, approval, suspension and cancellation of certification, application and fees. To inquire about becoming a Program participant, you can contact the CDFA Nursery, Seed & Cotton Program office by phone at (916) 654-0435.